There is space in every girl’s wardrobe for a do-all dress, that never lets you down. It’s usually flattering, goes with everything and can be adapted for a multitude of events and occasions. 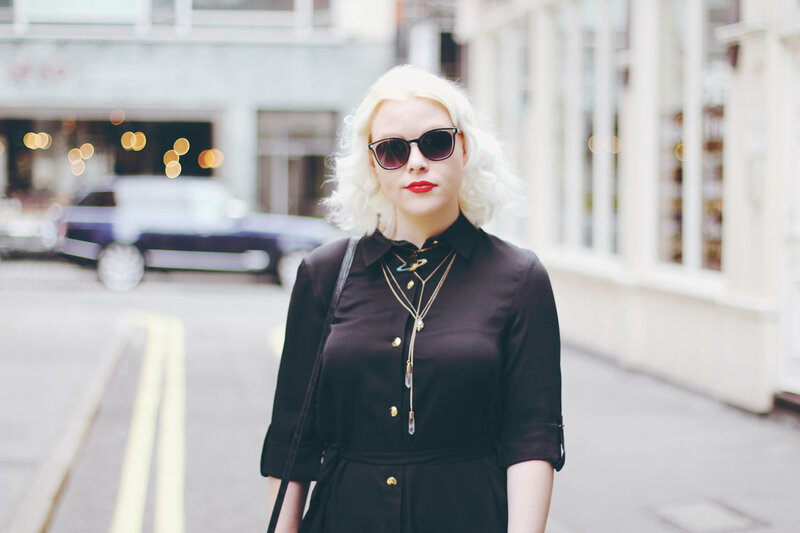 My new staple and saviour comes in the form of a shirt dress, which is typically the shape I choose when looking for a dress for every possible situation. Today’s dress of choice comes courtesy of Closet London, who very kindly offered to let me pick out a piece from their new collection. 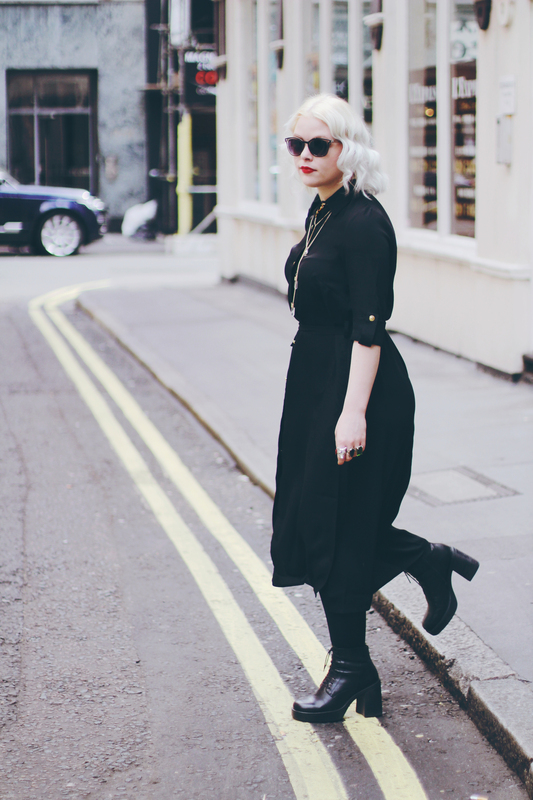 This longline shirt dress immediately caught my eye, it’s black, it’s smart, it has gold hardware- what’s not to love? In summer a breezy shirt dress can be exactly what you need, and this one comes kitted out with slits up the side to maximise comfort and allow the material to flow. You can obviously unbutton it a little and wear it looser for now, but then come autumn/winter it’s instantly easy to layer up to keep warm and stay stylish. Since this beauty arrived in my postbox, it’s been to a work meeting, out for lunch, to an exhibition and been worn on an easy weekend day perusing London’s streets. On this occasion I teamed this dress with a myriad of necklaces and rings, which are my ride or die accessories. I also toughened it up with my Vagabond Tyra lace ups, which give me enough height- as this dress is a midi. If like me, it’s rare for you to have a great deal of time to get ready between work and meeting friends/heading out, then dresses like these are lifesavers. I can, and have headed to work in this and simply changed accessories and slicked on some lipstick on the tube post-work. It doesn’t necessarily say ‘I’ve just come from work’, when you’ve loosened a button or two and have changed from court shoes to ankle boots. I love the weight of this material, and how luxe the fabric feels, not to mention the fact that it’s completely opaque! So many shirt dresses like this don’t leave much to the imagination, due to them being reasonably sheer, which is a real dealbreaker- especially as it means you have to wear another layer underneath, something which is far too warm in a city summer. Although higher on the high street scale at £52, this wears, washes and can be worn again and again like a dream, something which sadly isn’t that common when it comes to affordable pieces. 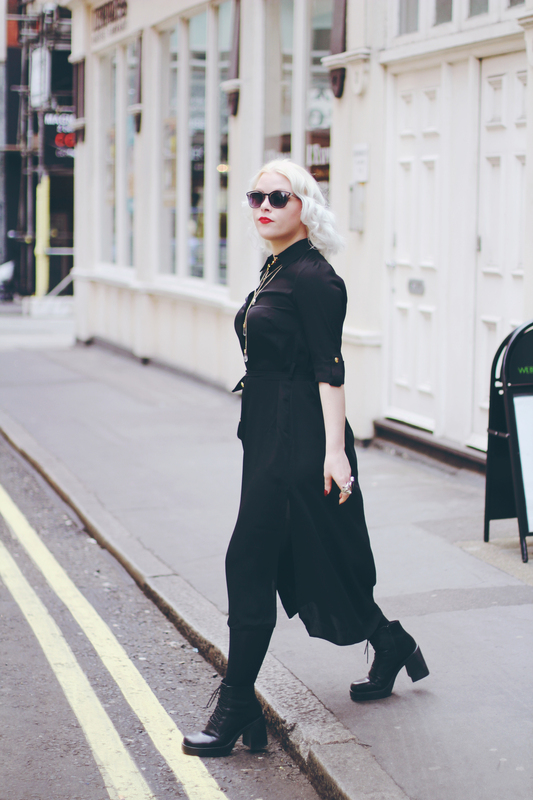 You can’t beat an all black oufit! You look great. I love the rocky accessories and boots too!